Oh friends. Guys. Y’all. I’ve been waiting for this day since before we moved in a year ago. I’ve anxiously anticipated this reveal more than any other because this really is the heart of our home. 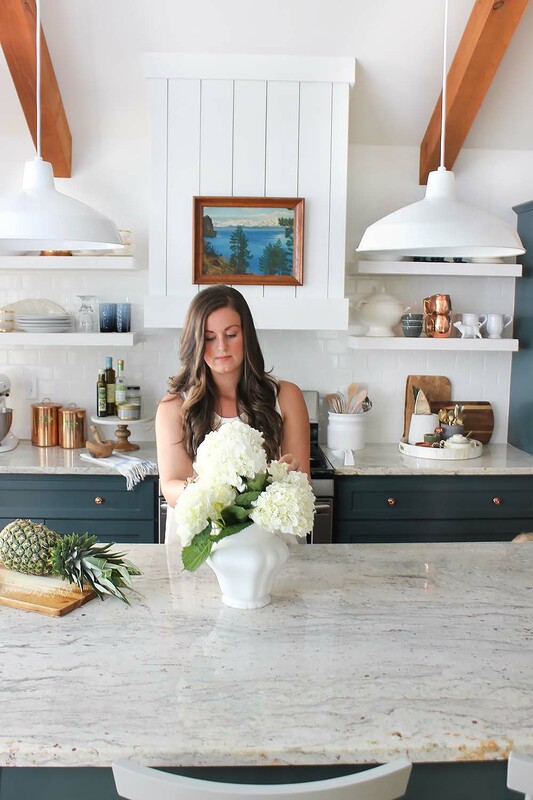 I’ve grown to love cooking and baking and know I spend so much time in here so getting the renovation done and then pretty and styled has been high on my list. Those finishing touches just make you feel good, ya know? And the day is here! If you missed the progress post from last week, make sure you check it out. It links to all of the important posts for this room that have happened along the way. Let’s dig right in, y’all. I’m going to try to give some details and answers along the way because I know there is a lot in here that hasn’t been talked about. Welcome to my favorite room at The Buffalo Bungalow! You may remember that the green cabinets and the rug were the first thing I chose for this room. 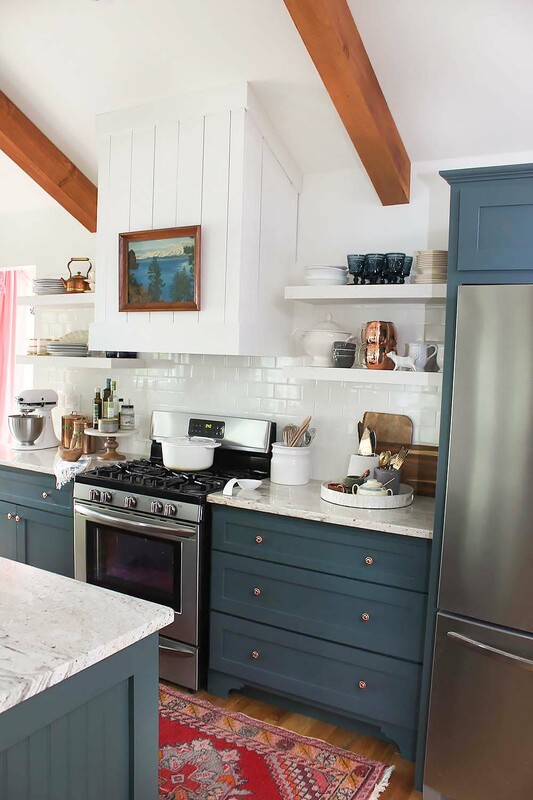 The cabinets are painted Benjamin Moore’s Hidden Falls (like the exterior of our house and the fireplace!). Definitely my favorite color of the moment. And I love how the gray Windsor bar stools from Target look against the green. They provide a little color mixing for me without being too crazy and they pull some of the grey veining out of the counters. We hired a local custom cabinet guy to make the cabinets for us. We called around and got quotes and he included painting them, plus we got to completely design our entire layout. It was totally worth it. We’d considered doing IKEA cabinets, but by the time we put the million pieces together and paid someone to lacquer them, there wouldn’t have been a huge difference in cost. You can read about the cabinet layout we picked to add function here. I love the mix of the green cabinets, red Persian rug (found on eBay), glossy Copper pulls (also found on eBay), and the marble-looking granite. 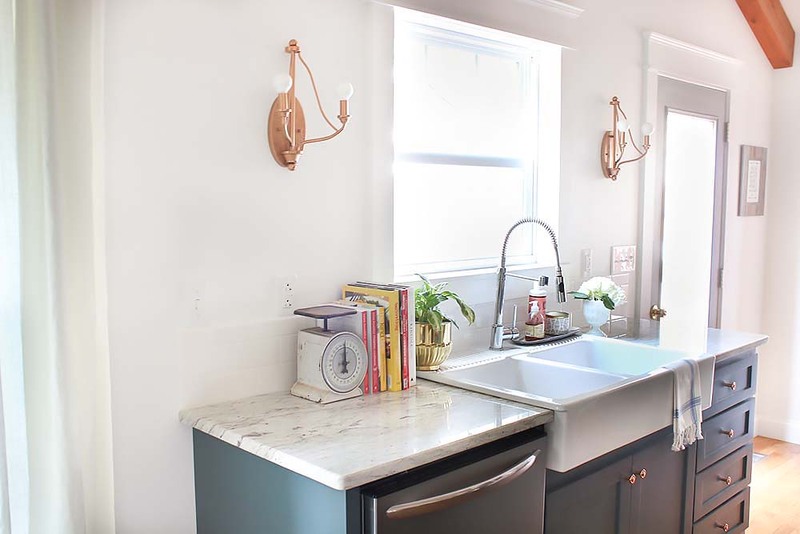 Y’all may remember from our last kitchen that I love the look of marble, but we’ve been told time and again not to do it because it scratches and stains so easily. I know friends who have it and love it, but we I’m just worried with how we function with little kids it might be a waste. Plus it’s more money. This River White Granite was the closest match I found, while keeping the durability of granite. We’ve had it a year now and love it. I have so many favorite things about this kitchen, but I think one of them is the symmetry of the main view. I love how the island is centered in front of the hood, making it the real focal point. The two beams coming down on either side of it and the two lights hanging down over the island….I love it. I debated so many different options for the hood because I knew I wanted it to make a statement. I considered doing a copper hood, but I quickly nixed that because I knew it would “match” the wood beams too much for me, same tones. I stared and stared at our half-finished kitchen for quite awhile trying to picture the hood and I finally knew it had to be simple and white. I wanted all of the green to stand out and I wanted a lot of white up top to balance it. 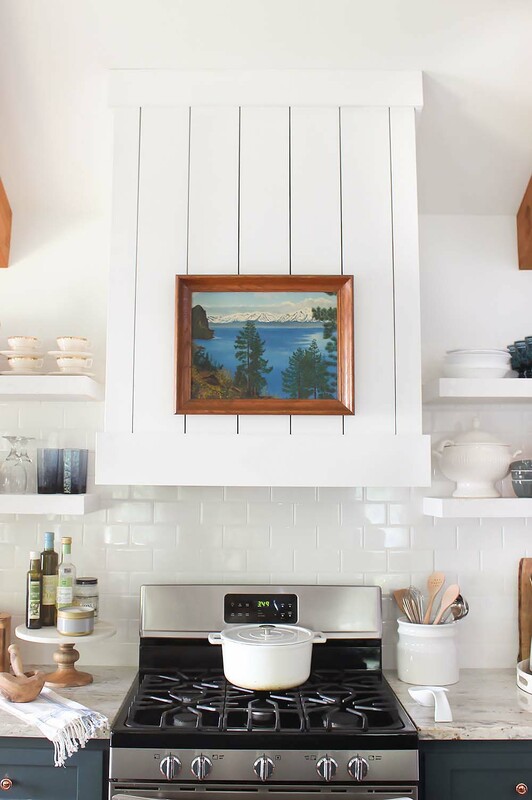 I wanted it to still be a focal point even though it was white, so we finished it with vertical planks and a favorite vintage landscape of mine that ties in the overall colors of the kitchen. I love the flexibility that gives me to change the look by hanging a different picture, hanging a wreath at Christmas, etc. We went with simple subway tile all the way up above the top shelf. I wanted it to really fill this space and while it is just white on white, I really like the texture it brings in. Having the tile finished was the main thing that made us go, “Okay, this is a kitchen now!” Something about all of the sheetrock since we don’t have upper cabinets, made this not feel quite right. I wanted the shelves to just disappear and let the focus really be on what was on them. So we did a simple, white floating shelf. Styling a kitchen really is my favorite part. I love all the little details that make it useful, but also pretty. Having pretty little things in the kitchen makes it a lot more fun to spend time in there and cook for me. We did only open shelving in our last kitchen and we always got questions about how it functioned for us. I LOVED it and absolutely wanted to do it again! Before we did that kitchen, I made sure that I had enough storage below for all of the things you wouldn’t want on an open shelf. We made sure of that here too and the open shelves are really functional for us. All of the dishes, glasses, and mugs we use on a daily basis are right there. Y’all know the other side of the room was a bit of a mystery for me. But I love how it turned out. I was initially worried we’d wired the sconces in at the wrong height and so many of you agreed. But I knew if I could find the right sconce I had pictured in my mind, it would be perfect. I came across these sconces in our Lowe’s store and thought the shape and size were perfect. They were originally black and were displayed with candelabra bulbs, so they look very different now. We painted them with my favorite copper spray paint and used round bulbs to modernize them a bit. This spray paint is a bit more, but oh the finish is so worth it. We’ve already gotten asked where we found our unique copper lights. This side of the room is simpler, which I actually love. There’s a lot going on in the space, so this kind of lets the room breathe, I think. 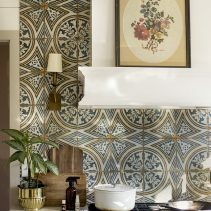 We debated and debated on tile. I knew we needed something behind the sink with this crazy awesome (but forceful) sprayer we got from Home Depot. 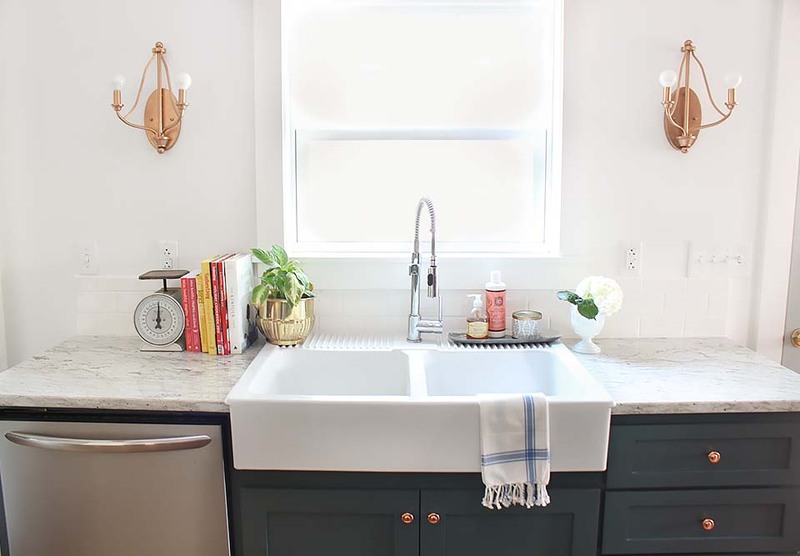 But since the cabinets on this side sort of float like a piece of furniture on a big wall, I didn’t like the idea of tile going too far up because I really thought it would look like it was just slapped on the wall with nothing (like the shelves on the other side) to define it. Since all of this space is so open, I love having these rooms finished. It’s not like when it’s separate, you can just shut the door and forget about it until it’s done. Now we have lots of pretty views to enjoy. More than anything, I’m so excited for things to come in this kitchen. I see myself baking up a storm with a stool pulled up beside me and my little helper learning as we go. 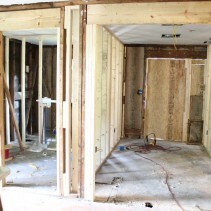 I’m giddy just thinking about all of the holiday baking, Sunday suppers, and memories that will be made in here. It was a long wait for me (and for y’all too, I know! ), but it was oh so worth it in my book. It’s stunning!!! Love every detail! This is beautiful. You said the cabinets were green, they look blue. Can you please tell me what the color is and is it available in a paint store? My dream kitchen ! ! ! THanks Nancy! It is a dark green from Benjamin Moore called Hidden Falls. It’s a hunter green, but does have blue undertones, so in different lights more blue shines through than others. Any store that carries Benjamin Moore will have it or you can have it paint matched at home depot or lowes. Bravo, I love it! The colors and textures bring such a depth to the space. Oh I’m so glad, Viktoria! That would be amazing! Well done. The beauty is in the details. Loving the copper! Thanks, Deborah, I couldn’t agree more! so, so beautiful! you did a wonderful job! I LOVE how it all turned out! It’s so funny though, I always pictured like 10 feet between your living room and kitchen and thought it seemed weird but the view with the club chairs and bar stools included makes it all make sense now! Congrats on this, so pretty! Hahaha Amanda, isn’t that funny! So glad I showed more of what this space looked like. OK, I’m blown away!! I absolutely love it!! You guys did a great job and now I want to copy the same thing at my house!! LOL! The kitchen looks beautiful, exactly your style! I love the granite you used! Thank you so much, Kristen! I do love this granite! So so good! I mean this has a huge compliment – your home feels so attainable to me as reader based on budget design with high style! Something I feel is hard to find in blog these days! 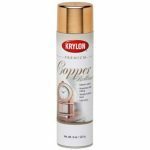 My one question is on the cabinet paint color – I love it! It reads green with strong blue undertones on my computer is that accurate? I love what I see just didn’t know if it was more green in person. Again great job on a beautiful space!!! Kelly, I take that as a huge compliment! That’s exactly how I want it to feel 🙂 Thank you so much! So, it’s definitely a hunter green, but there is some blue to it. It’s not strictly green, if that makes sense. I think in most pictures it reads pretty true, but some may look a slight bit bluer than in person. It’s so beautiful and completely exceeded my expectations! I have to ask, for some reason I was thinking you had a pantry to the right of the fridge? Where do you keep your pantry items; cans, pasta, etc? You have just outdone yourself! I know you will have such fun making family memories in your lovely space. The sconces are just perfection but the styling is what makes your home so special and full of personality! Gurrrrllll! It looks AMAZING! Loving every detail, especially the colors! So pretty! What a light and open space. It looks like a perfect spot for memory making. That kitchen is beautiful. I love it and all of the parts that you have chosen to make it perfect. I really love the grainite–did you have to order it? Was it in stock? I would love to know the details on it as it is exactly what I want for my galley kitchen redo. Your daughter is so adorable!! Thanks so much, Shar y! I’ll share some about it next week, but we have a local granite guy and he handled everything. He gets it all from a local supplier, Slabco, and this one was in stock and ready to go! We told him to go for it and he got it installed the following week! Just gorgeous! Thanks for the inspiration to give my kitchen a thorough scrubbing and styling for fall! SO pretty!! Love every detail! Thank you so much, Sarah! That means so much coming from you! This is breathtaking Lindsay! 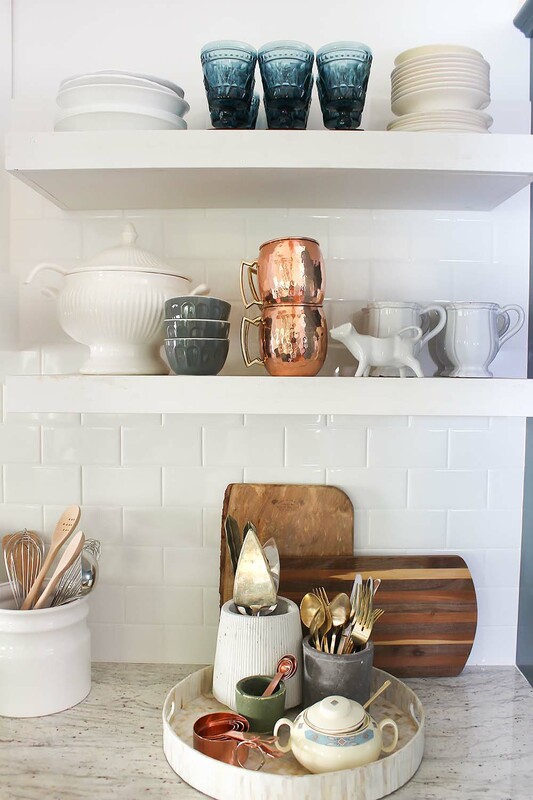 I love the copper and that color on the cabinets is amazing! My jaw is dropping on the floor from so many stunning pictures! Absolutely gorgeous! Every detail is done to perfection! That island is to die for!! All done just in time for the holidays. Baking, having the fireplace roaring, connecting with family and friends- well, nothing better! And having your precious Rosie right at your side puts the icing on the cake!! Thank you so much, Ardith! I’m so grateful! Austin, you are so sweet. Your comments always make my day! Thanks so much girl! You are such a sweet friend! finally getting over to comment after i showed this to chris the other night saying, “LOOK AT THIS KITCHEN! I LOVE IT!” it’s amazing lindsay- i loved your last kitchen so much and thought i couldn’t love this one more, but i think i might. Oh Cassie, thank you so much!!! Your new kitchen is stunning Lindsay! 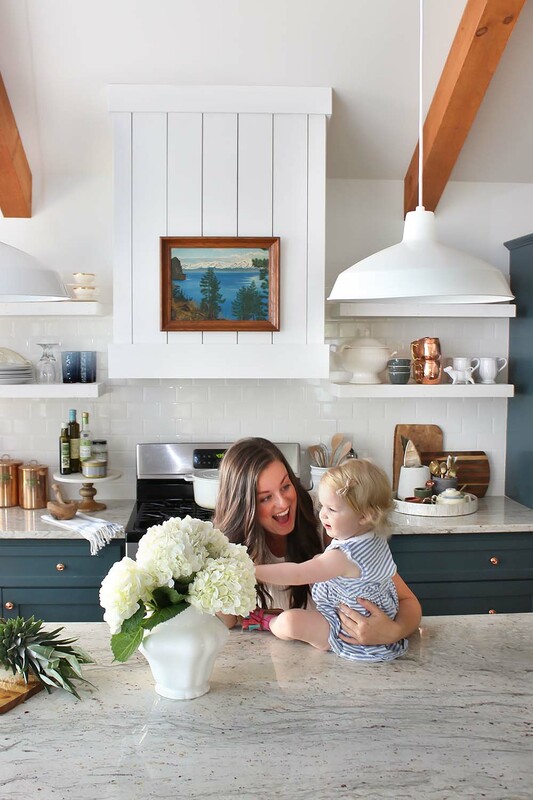 I love that you used that pretty green paint from your fireplace on the cabinets, it looks amazing with the all the white, your countertops and the copper accents! Hope you are enjoying your beautiful new space. Wow, very pretty & functional! Thanks for the lead on those target stools… we just might use those in our new kitchen! It’s beautiful. 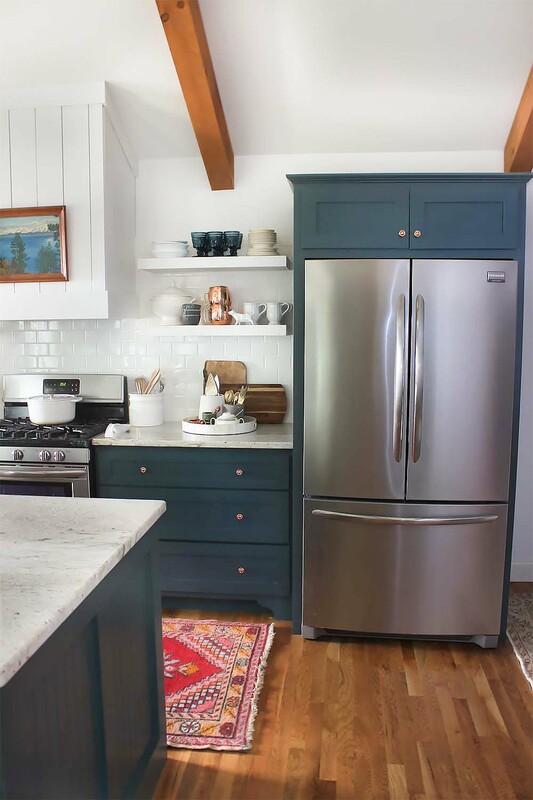 Love the blue cabinetry and open shelving. You must be thrilled to have it done! Everything looks so awesome (as always)!! I LOVE the cabinet color! have you seen jenny komenda’s latest post on little green notebook? looks like you guys were on similar kitchen wavelengths! so cool. Hands down one of my favorite kitchens I’ve seen in a very long time!! It’s stylish and cozy and personal! Absolutely gorgeous!! Thank you so much, Laurie! That means so much! You weave a story of life, love, and living into all of your design projects. That is what make a house a home! Well done! I’m so happy that even as you look forward towards happy times to come in your completed space that you truly enjoy enjoy it now, in this moment! Savor it and ENJOY the fruits of your labors, as it is apparent, that it was a labor of love & a journey of thoughtfulness! Thank you for your kindness & hospitality from afar! LOVE the sconces!! They turned out so fabulous! Your Kitchen looks beautiful! I love all of the mixed elements! Very timeless! 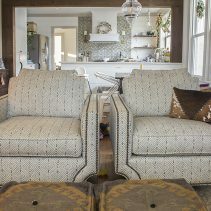 Where did you get your chairs in the family room shown here? Hi Kelly! They’re from arhaus! It’s apparent that you put a lot of thought and love into creating something so beautiful and original! The only thing I would change is I’d like to try painting the planked part of the hood the gray of the tall chairs. Love love love! I am curious what colors and finishes you used here on the walls and cabinets? And 2. 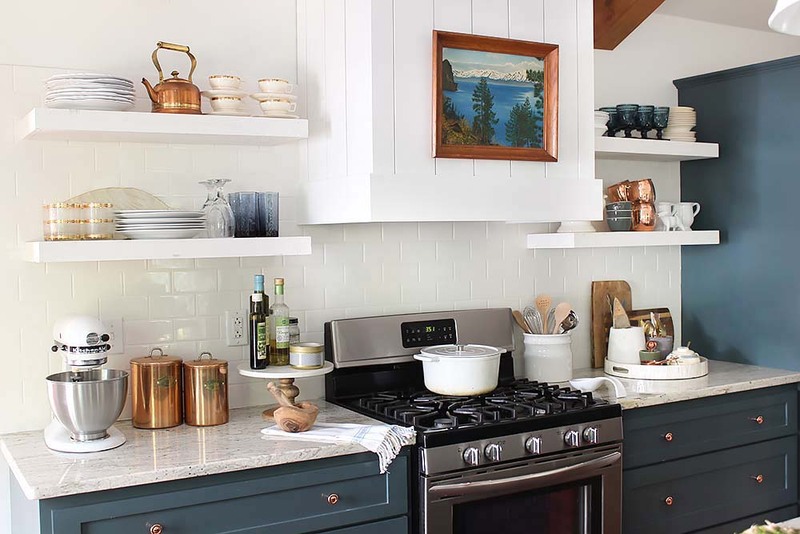 ( ok, three questions) I have white floating shelves exactly like you have and am planning on putting up white subway tile backsplash. But because it’s a true floating shelf, there is a very little bit of wiggle in the shelf. So I’m wondering if you tiled around the back of the shelf where the shelf sits against the wall, or if you tiled underneath where the shelf sits against the wall ??? I would be VERY GRATEFUL for your insights on this. HI Gail! I am so glad you’re here and that you found us! Melissa is awesome! So we got our subway tile at Lowe’s….I think it might be their store brand? 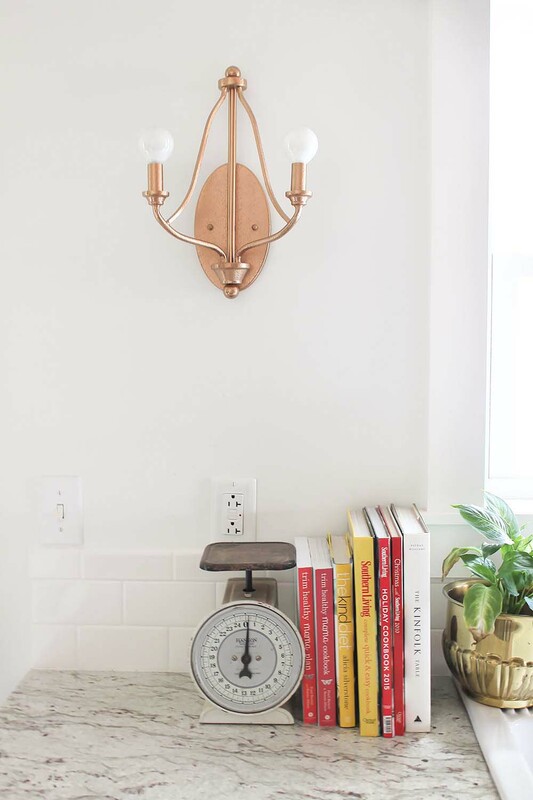 it was the only basic subway tile they carried and was the cheapest option. 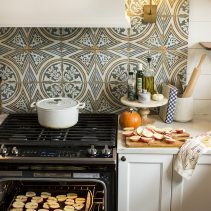 The grout is a true white grout…I’m sorry I don’t remember the exact color! I think we chose one up from the brightest option so it wasn’t so harsh. And great question on the shelves! We actually hung the internal steel brackets first, then tiled up to that. The shelves are basically boxes that slide right on the steel brackets. I hope that helps! Send any more questions you have my way! I love your kitchen sink! We are in the middle of a remodel and can’t find one we love. What brand is this one and where did you find it 🙂 why do you love it?! I thoroughly appreciate this detailed post and your thought process behind some of the decisions you made. Balancing the functionality and overall aesthetic is proving to be more challenging than expected in such a high priority room. Thank you for your insight. 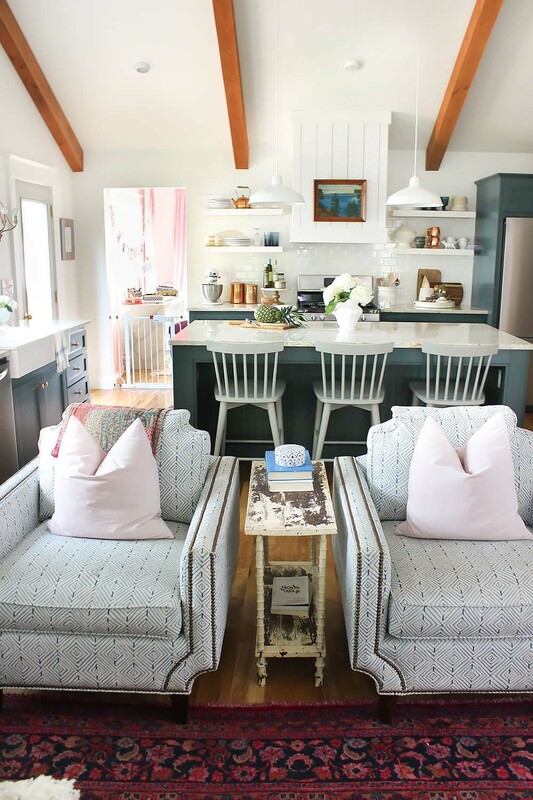 I second what Kelli said – this is a gorgeous kitchen – but it also reads ‘attainable’. And it is absolutely charming. I can see you and your family living here (and loving it) forever! Aww thank you so much! That really means so much to me! Love your kitchen!! I love rug by the island and stove! Where did you get it?? Thank you! It’s from eBAy! Beautiful! what color is your door? Hi so I have two questions, and I REALLY hope you reply cuz I am in the middle of 2 bathrooms and a kitchen remodel and LOVE your style. HI Brandi! Thank you so much! The white is Benjamin Moore Chantilly Lace and the subway is just plain old subway from Home Depot! Super cheap and classic 🙂 Good luck with your renovations!! 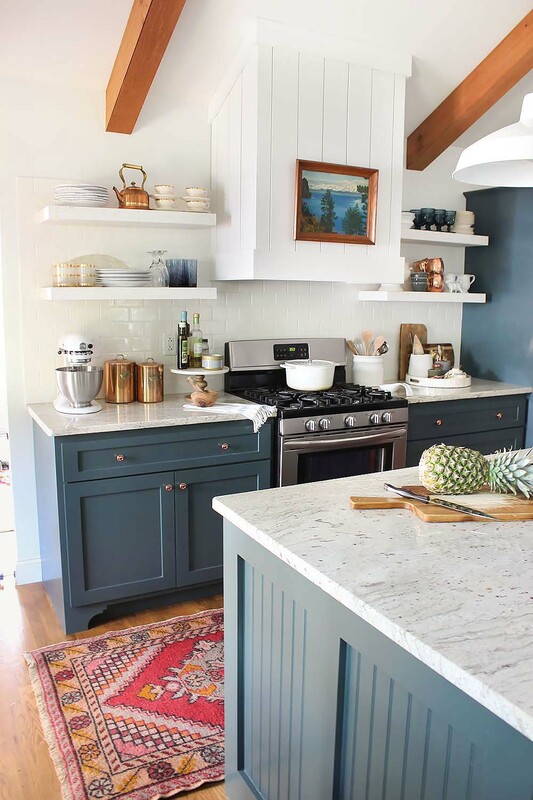 Hello – wondering where you got your beautiful, bright rug (the one between the island and the stove). I LOVE it! Thank you, Janna! I found it on eBay! Love buying vintage rugs there! Where is the kitchen runner from? eBay! It’s my favorite source for vintage rugs! Love it!! 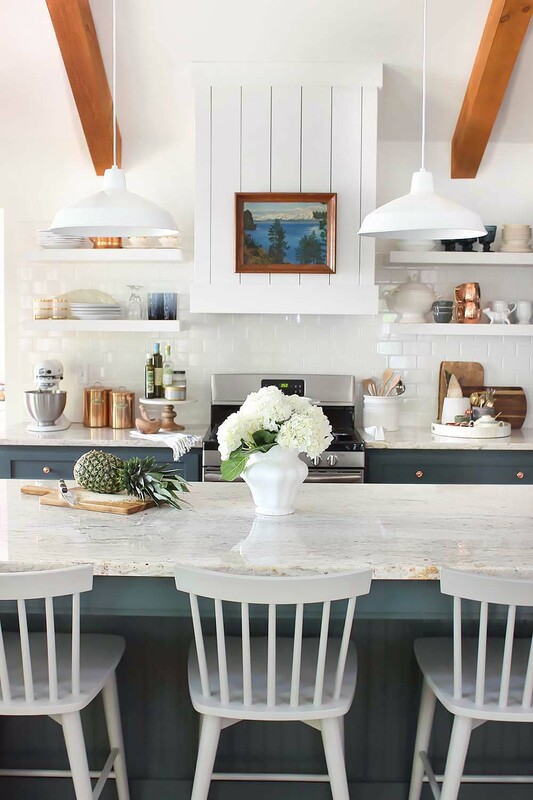 Actually using this as one of my inspiration sources for a little kitchen refresh of my own! I’m going blue, but this green is amazing.